Rose Amachi, an alumna and mentor of TechnoServe's Young Women in Enterprise program, is working to empower girls and young women in Nairobi's Kawangware slum. In Kenya’s urban slums, men, women and children face poverty, erratic access to water and HIV/AIDS. Nairobi’s Kawangware slum is no different. Here, thousands of young women must confront these harrowing conditions every day in addition to discrimination and violence. It is here that a shy young woman named Rose Amachi decided to chart her own course and transform her life just three years ago. Today, Rose is a confident and successful 24-year-old business owner who is inspiring young women to follow their dreams. 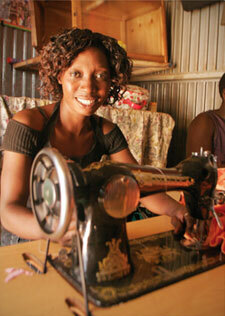 After she completed TechnoServe’s Young Women in Enterprise (YWE) program, Rose opened a small tailoring business. She saved enough money to buy a new sewing machine, expand her inventory and move her growing business, Lucky Outfitters, to a larger and safer space. In an area where most people live on less than $1 a day, Rose now earns $100 per month and plans to continue expanding her business. But she did not forget about the girls in her own neighborhood. Determined to break the cycle of poverty, Rose began training girls from the Kawangware slum in tailoring, providing them with an opportunity for financial independence. She even hired a young YWE participant and became a mentor in the program, helping motivate more girls like her to follow their dreams. Rose’s experience also gave her the tools to help her mother start a business in rural Kenya. With support from the Nike Foundation, the Young Women in Enterprise program has equipped more than 4,000 adolescent girls and young women like Rose with the skills and support they need to enter safe and productive economic opportunities. Rose worked hard to learn essential life skills, become financially literate and prepare herself to launch her own enterprise. The confidence, social networks and mentorship that young women gain through YWE are as invaluable as the business skills they develop. You can help people like Rose lift themselves and their communities out of poverty. Lately, Rose has done even more. Through a new program called Girls on the Move, Rose is helping girls in the Kawangware slum access better economic opportunities. As an alumna and mentor of YWE, Rose was invited to establish and develop a community-based organization – Kawangware Young Women Entrepreneurs – to empower girls ages 14 to 19. In her role as a community mobilizer, Rose is responsible for recruitment, education and connecting participants’ families with community leaders. Her work to empower young women in the Kawangware slum is transforming their lives and benefiting the whole community. People like Rose are proof that hardworking people can lift themselves and their communities out of poverty. TechnoServe works closely with enterprising individuals like her in over 30 countries to generate income, jobs and wealth across the developing world. Thanks to our Board of Directors, every dollar you donate will be matched through November 30, up to $250,000. Please make the most generous gift you can today to help even more people like Rose lift themselves and their communities out of poverty.